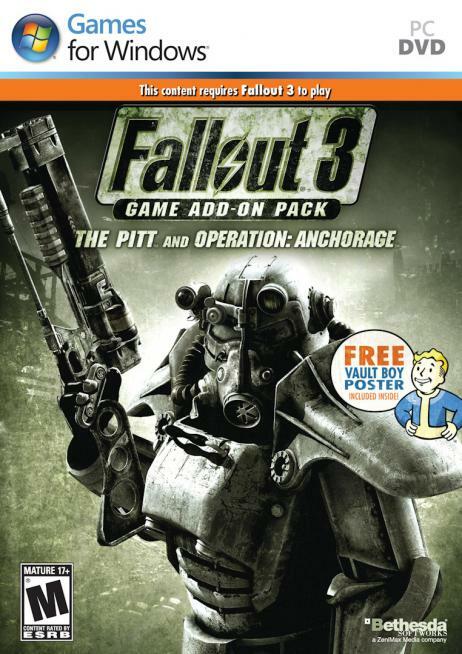 The Pitt is the second DLC pack released by Bethesda Softworks for Fallout 3. It follows in the footsteps of Operation: Anchorage, which was released in January. Operation: Anchorage offered a completely different look and feel than the main Fallout 3 campaign, but it also stripped away almost all of the game's role-playing elements, and so it wasn't warmly received. The Pitt takes the opposite approach. It delivers quests and situations that fit right in with the main campaign -- but to the point where you might feel like you've played them before. I think The Pitt is a step in the right direction for what people would like to see from a DLC, and it's certainly an upgrade over Operation: Anchorage, but Bethesda isn't exactly wowing anybody with their crafting skills. The Pitt starts off exactly like Operation: Anchorage. You receive a distress beacon on your radio, and it directs you to where you should go to start the new quests. In this case you're told to go to the northern edge of the map, where you meet an ex-slave (or perhaps an ex-slaver) named Wernher. Wernher tells you all about the Pitt, a combination slaver city and steel mill located in Pittsburgh, and he asks you to help him out with a plan to free the slaves there. This leads to you infiltrating the city, fighting in an arena, and confronting the slavers -- or perhaps joining them. The Pitt consists of three new quests and about nine new areas. Unfortunately, while the content here is less linear than in Operation: Anchorage, it's not less linear by much (there's all of one optional area for you to explore and one choice for you to make), and you're pretty much pigeon-holed into following a particular path. For example, when you first arrive at the Pitt, the game makes it look like you have some options, but you don't. Whether you try to talk your way past the gate guards, or shoot the gate guards, or pretend to be a slave, the DLC proceeds in exactly the same way, and everybody forgets how you arrived. Fortunately, the new content is fun enough. The DLC introduces you to the (auto axe) which is sort of like a chainsaw, and it's effective against the (trogs) (essentially feral ghouls) that you have to fight. There's an Easter egg hunt involving steel ingots, and it's a lot more fun than the similarly themed intel case search from Operation: Anchorage. And finally, there's a bunch of new items for you to find and use. Even discounting the basic slave clothes and items that are just there for theming purposes, the DLC adds something like 16 new items for you to try out, including silenced assault rifles, two new types of power armor, and four different types of auto axes. But still, while The Pitt has some stuff that makes it fun to play, it suffers greatly from a (been there done that) kind of mentality. I mean, the main Fallout 3 campaign didn't have all that many quests, but three of them involved slaves and slavers, so did we really need more? Why not give some quests to the super-mutants, who are largely just presented as dumb brutes? Wouldn't it be better to learn something more about them? The DLC also features raiders (which I've seen more than enough of), trogs (which are only cosmetically different than feral ghouls), an arena challenge (which I wouldn't mind never seeing again in an RPG), and combat that was no challenge at all for my level 20 character, even when he had his equipment stripped away. How about a DLC where I actually have to remember to reload my weapon after each fight, and take some meds to ensure that I survive? No such luck here. By my estimate, the DLC takes somewhere around 3-5 hours to play, depending on how long you decide to search for steel ingots. I enjoyed the content well enough, but I didn't love it. The Pitt is definitely a DLC where there isn't necessarily anything wrong with it, but there isn't anything especially right about it, either. Plus, given the playing time, the lack of replayability (maybe you'll want to play it twice, and maybe you won't), and the cost, Bethesda's DLCs still feel more like a money grab than anything else. BioWare had a much friendlier price point for their Neverwinter Nights premium modules.